In Ireland window tint is legal to use up to a certain darkness level. This article will give you a brief rundown of Ireland window tint laws and other regulations concerning these vehicle modifications. VLT means Visible Light Transmission, and this number represents the percentage of light able to pass through your car windows. 65% VLT window tint allows 65% of total light to pass through, and blocks 35% of visible light. See examples of different tint darkness! Window tint is part of NCT (National Car Test) testing in Ireland. If you install window tint which is not legally permitted your vehicle will fail inspection. Window tint is tested with a device called a light meter or photometer, and you should know that police officers in Ireland are also equipped with these devices with increasing frequency. Road Safety Authority allows up to 3% variance in window tint levels, however due to light meters not being 100% accurate we do not recommend tinting windows beyond legal limits. 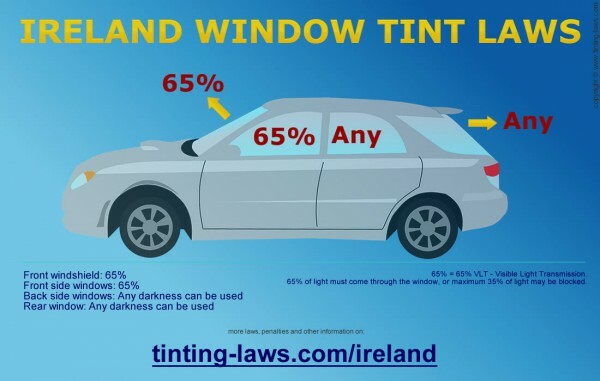 Ireland does not allow medical exemptions for darker window tint. Road Safety Authority – Vehicle Parts – see FAQs on Window Tinting on All Vehicles (.pdf file, 290kb; mirror link – file last retrieved March 2019). National Car Test (NCT) Manual 2018 (.pdf file, 3MB; see page 25; mirror link – last retrieved March 2019). Our information about Ireland Window Tint Laws was last updated and verified in 2018 and 2019. Our articles are constantly checked for accuracy by our partnered local traffic law experts, but in case any of our info provided is not up to date or correct be sure to contact us so we can fix it. Thanks!